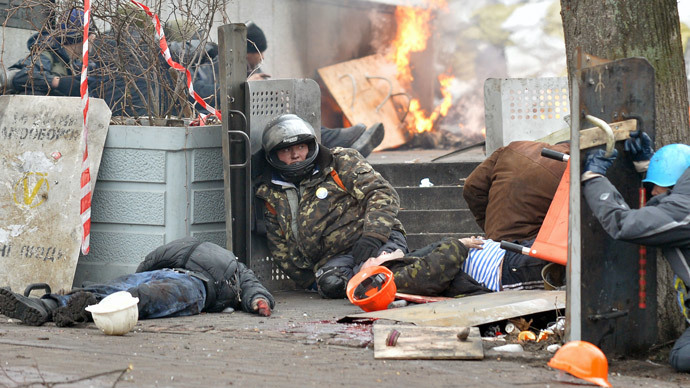 Berkut riot police weren’t involved in mass killings by unidentified snipers in Kiev on February 20. The detention of its officers is an attempt to tarnish Ukrainian law enforcement, Berkut veteran organization head, Vladimir Krashevsky, told RT. 12 Berkut officers were detained for being part of the so-called ‘black company,’ which were given sniper rifles to provide cover for their retreating comrades, Oleg Makhnitsky, Ukraine’s acting Prosecutor General said on Thursday. 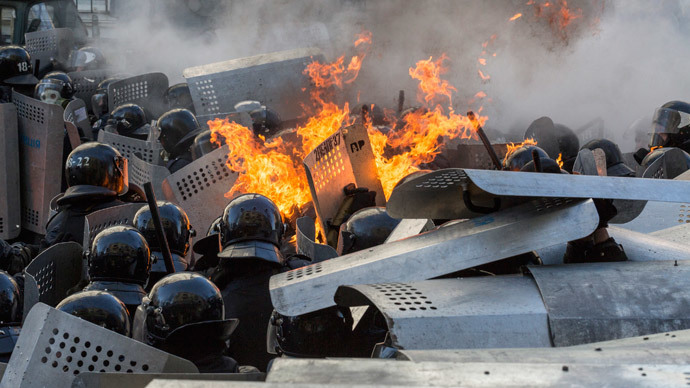 Krashevsky has refuted claims that Berkut used fire arms against the demonstrators on the bloodiest day of the Ukrainian coup, which saw President Viktor Yanukovich ousted and 42 people dead. “At around 8:00 AM local time [on February 20], the withdrawal of the interior troops and Berkut forces began in several directions. At that moment the troops – who were unarmed – came under sniper fire from several buildings,” Krashevsky told RT. According to the veteran, Berkut’s covering troops had to perform the risky operation of evacuating 300 interior ministry servicemen from Kiev’s Oktyabrsky palace. “During the cover operation one of the Berkut troops, Nikolay Semchuk, was killed by two snipers. Snipers call this a ‘double shooting’, when two shots are fired at the same. One shot landed in the leg and the other – in the head,” Krashevsky added. “Its staff include 90 people, with 23 of them being present in the area where gunfire came,” he said. “They are officers – the commander of the company and two others. As yet, I’m unaware of the charges laid against them. But so far I’ve learned that they’ll have to take a polygraph lie detector test,” he said. “There was an info war, a massive one, from the Western and Ukrainian media,” he stressed. The identity of the ‘Maidan snipers’ is a hot political topic in Ukraine and abroad, with both protesters and police among those killed by sniper fire in the center of the Ukrainian capital. The prime minister in the Ukrainian coup-imposed government, Arseny Yatsenyuk, says that ousted president Yanukovich should answer for the killing of the Maidan protesters. He told the BBC that a criminal investigation had been launched against Yanukovich, accusing him of mass murder. The Ukrainian president, who fled to Russia following the February-20 events, has said many times that he did not order the police to shoot at the demonstrators. Yatsenyuk now wants him to defend himself in a Ukrainian court, adding that there’s compelling evidence that “senior Ukrainian officials were responsible for the massacre of people” in Kiev. A leaked phone call between EU foreign affairs chief, Catherine Ashton, and Estonian Foreign Minister Urmas Paet talked about the strong suspicion that people among Ukraine’s new leadership were behind the snipers. Earlier, Aleksandr Yakimenko, who headed the Ukrainian Security Service during the Kiev standoff, said the so-called Maidan Self-Defense Force controlled the building from which the snipers were shooting.